Growing up, my mother always scoffed at me when I played with my food. I would segregate the food into zones; “like” & “dislike” and made mountains of rice around the plate. They even had structured roadways in between. Quite elaborate -might I add. The objective, was to push all the “disliked” items away to the sides thus pretending to show a clean plate before I was excused from the table. In actuality- it never worked! I was thrilled to receive a call from the dynamic duo (No,NOT Batman and Robin- champagne with Wayne will follow shortly someday, *wishful thinking*) who run a posh swanky restaurant- A Reverie in the northern belt of Goa. Known for their creativity and love for all things unique I decided to accept the invite with gusto having been told the dining concept was a playdate with ones food. Payback to the folk after all these years. The objective clear; a blend of world cuisine on a plate (7 course meal to be precise over a multitude of dishes) delicately infused with local Indian flavor and panache. A creative marriage in the making perhaps? Case in point the affair of the Indian pakora & the taco all the way from Mexico. Sounds absurd, you say? Quite the contrary. If any of you have had the experience of driving behind trucks on the highways of India they have a phrase commonly plastered on the rear HORN-OK-PLEASE. The purpose of the phrase is to alert the driver of the vehicle approaching from behind to sound their horn in case they wished to overtake. The history of this phrase unknown; however there are multiple theories. In the early days all the good carrier trucks were manufactured by the TATA Group which had a brand of detergent- ‘OK’ which they cleverly advertised on the rear of their trucks by painting them. It had a symbol of the lotus. Quite effective free publicity might I add. Another theory states that the blackout on lights during the Second World War, if a car had to overtake a lorry at night, it had to honk. For this purpose, there used to be a red light under the truck which the driver would switch on to signal it was OK to overtake. It was the OK in the middle that would light up. So what business does a Taco have with a Indian pakora? After all a taco is a traditional Mexican dish composed of a tortilla folded/wrapped around a filling primarily beef,pork,chicken,seafood, vegetables and cheese to name a few allowing for great versitality and variety. Much similar to the Indian naan, might I add which is a common staple diet bread used by many households. Whilst the bhaji or pakora- a fried fritter snack often comprising of onions,eggplant, potato, spinach being the usual suspects dipped in batter of gram flour and then deep fried generally used as a accompaniment with a nice hot cup of tea- I really couldn’t place the unison. While quizzical at the moment – is also interesting to note the presentation of the dish sans any utensils. The taco back home in Mexico follows the similar custom and is accompanied by multiple garnishes; salsa,avocado,guacamole, cilantro, minced meats, onions and lettuce (now you understand the versitality of it all?) Trivia: it is one of the most popular street foods in Mexico and is never eaten as a main meal; they are generally eaten before midday or late in the evening.The origin of this word is in dispute with some saying its derived from the Nahuatl while others from various Spanish phrases. All said and done it brought out the kid in me. 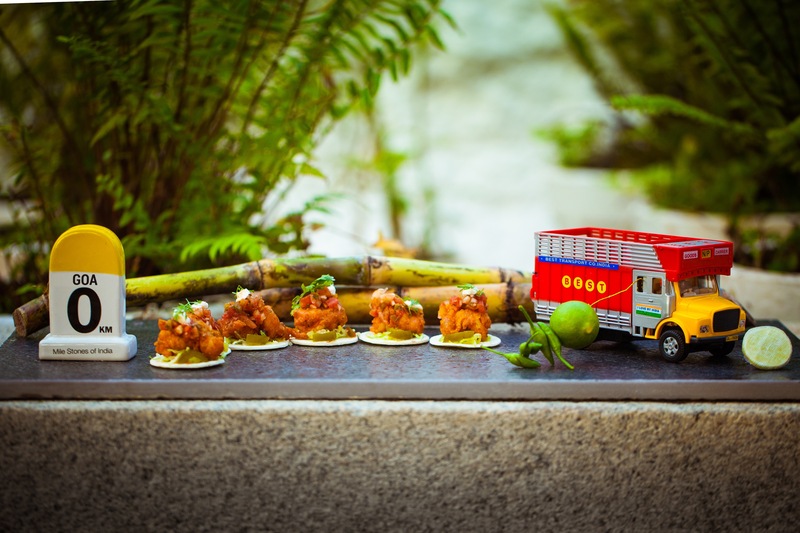 I played with that truck like there was no tomorrow not to mention the crunchy bites of the beer battered kandha bhajiya (onion pakoras) interspersed as a gentle afterthought. Snuggy this is one meal i wouldn’t send your way. No offense pup. Look at me now Mum- I’m still playing with my food.